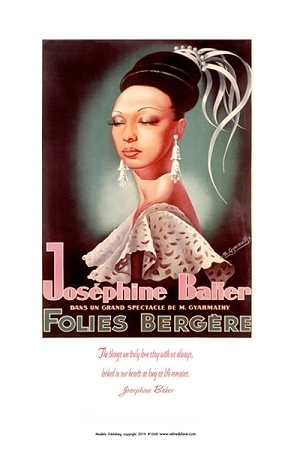 Home > Gift Ideas > Heritage Prints > Josephine Baker Print 11" x 17"
Freda Josephine McDonald, was a French dancer, actress and singer. She was given the nicknames "Black Venus," "Black Pearl" and "Creole Goddess." She renounced her American citizenship in 1937 and became a citizen of France. Though based in France, she supported the American Civil Rights Movement during the 1950s, and protested racism in her own unique way, adopting twelve multi-ethnic orphans, whom she called her "Rainbow Tribe." She also refused to perform for segregated audiences in the United States and worked with the NAACP. For some time she lived with all of her children and an enormous staff in a castle, Château de Milandes, in the Dordogne in France. (Baker had only one child of her own, stillborn in 1941, an incident that precipitated an emergency hysterectomy.) In 1963, she spoke at the March on Washington at the side of the Rev. Dr. Martin Luther King, Jr. Wearing her Free French uniform with her Legion of Honor decoration, she was the only woman to speak at the rally. As mentioned above on tours of the United States she refused to perform in segregated nightclubs. Her insistence on mixed audiences helped to integrate shows in Las Vegas, Nevada. Nevertheless, her career was on a downturn and she was near bankruptcy until she was bailed out and given an apartment by her close friend, Princess Grace of Monaco, another expatriate American living in Europe.